Let’s recap: Windows 10 Creators Update is focused on 3D content creation for the masses. High-end gaming, custom tournaments, and Dolby Atmos are coming to Xbox. The Surface Book is getting an update that’s gonna cost you. Oh, and there’s the new Surface Studio with a fun knob. But seriously, this year’s Microsoft event was the most exciting and well-rounded in recent history. And in case you missed any of it, we’ve got you covered. Connection is the name of the game for the latest Microsoft update. From connecting with other users in your life via its MyPeople task bar app, to an SMS Relay feature that allows you to view and reply to texts from your laptop, sharing content is a main focus. With Skype integration, you can easily view your Skype chats, as well as view emails from contacts, all from a single desktop pop-up. This feature works on both Windows and Androids. One of Microsoft’s most exciting announcements is the upcoming Creators Update and it’s huge focus on 3D. From the ability to scan real-work objects to the new Remix3D community, now anyone can design in 3D. Along with a new name, Paint 3D allows users to create 3D artworks using simple tools and brushes. You can also use your phone to create a full 3D model that you can easily manipulate and work with. The new digital art app helps you isolate objects from photographs, so you can replace the background with another image. You’ll also find new selection tools, including Doodle – which turns any 2D free-sketch into 3D – and pens enabled to work on any 3D object, so you can customize them. The new Paint 3D app is all about inspiration, so they’ve created a Web community to match. Members of Remix 3D can share 3D models and find others to use in their own artwork. These models can also be printed with 3D printers. A long-overdue Office update is also available, including 3D imaging and transitions in Word, Excel, and PowerPoint so you can present graphic elements from any angle you choose. While there is currently a preview version available, only US, UK, Canada, Australia and New Zealand residents may sign up. Microsoft seems to finally be getting serious about fully immersive virtual reality. The company is currently working with Dell, HP, Lenovo, Asus, and Acer to release several standalone VR headsets – starting at $299. The company also showed off a ‘HoloTour’ app, originally developed for HoloLens, which allows you to take Street View-like trips around the world. Want to get your hands on a HoloLens? That’ll cost you $3,000 a pop. The Creators Update also set its sights on the Xbox One S with three new features gamers are sure to love. With this update, Microsoft now makes esports and streaming super accessible. Windows 10 will let you broadcast gameplay live at the press of a button. And with Arena on Xbox Live, players now have the opportunity to create custom tournaments and challenges against your friends. Microsoft has also worked hard to bring Xbox gaming features to the desktop. With its Xbox Play Anywhere program, you can now buy a single game on Windows or Xbox and play it on either system. The console’s lack of support for next-gen audio standards has always been an issue. This is no more as the company announced a free update adding Dolby Atmos playback via bitstream audio pass-through. Microsoft announced a flurry of updates surrounding the Surface, but with one notable exception: a new Surface Pro tablet. Looks like you’ll have to wait a bit longer. 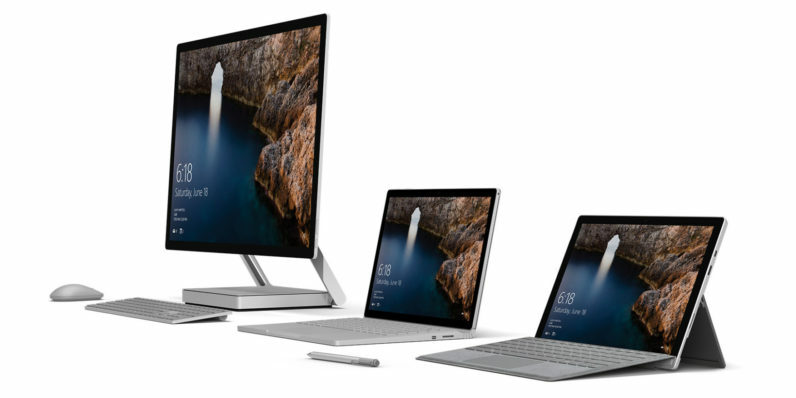 However, the all new Surface Book i7 – with its 13.5 million pixel display, twice the graphics power, a second fan, and 16 hours of battery life – should make up for the lack of a tablet. The most exciting news revolving around the Surface is Microsoft’s unveiling of the Surface Studio – an all-in-one touchscreen badass. It’s touted as having the thinnest LCD monitor to date with a 3:2 aspect ratio and over a billion colors. Additionally, the accompanying i7 processor includes 32GB RAM and not one, but two fans, all housed within an aluminum chassis with a single, unkinkable power chord. It also comes with a studio HD camera for high-end video conferencing. One slightly glossed-over feature was the Surface Dial – effectively a wireless knob that allows you to interact with various Microsoft devices. Though the on-stage demo left much to be desired, the possibilities of such a device are endless. What are you most excited about from Microsoft’s event? Let us know in the comments. Follow our full coverage of Microsoft’s Windows 10 event here.